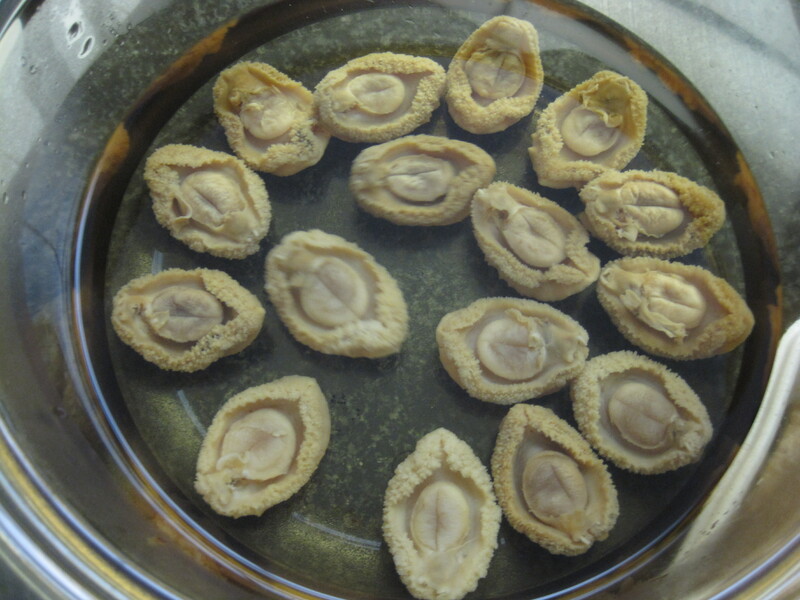 Small to medium sized dried abalone soaking in fresh water. 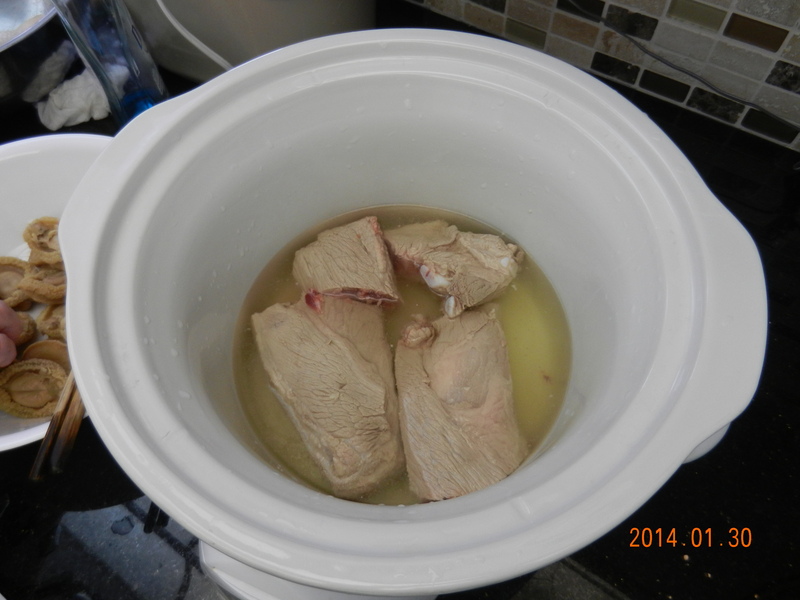 The bottom layer in the slow cooker consists of pork ribs. The middle layer consists of the whole abalone. 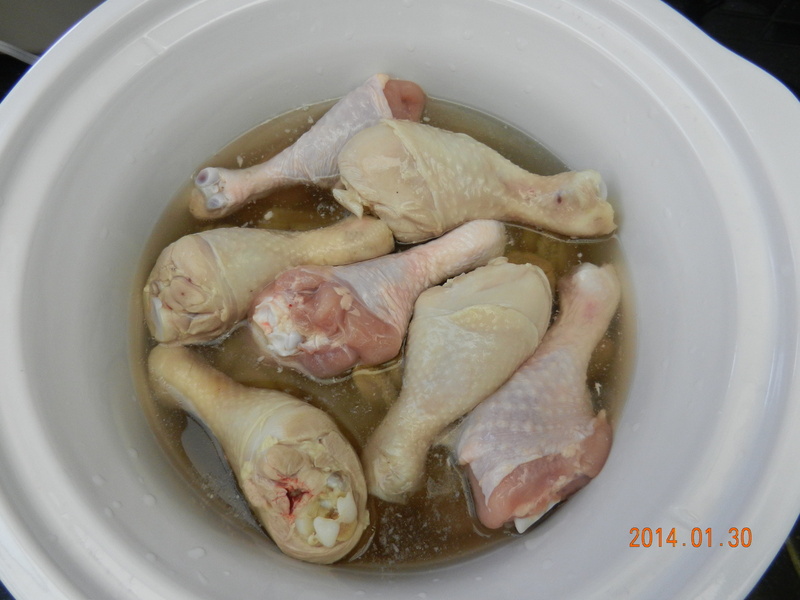 The top layer consists of skin-on chicken pieces. 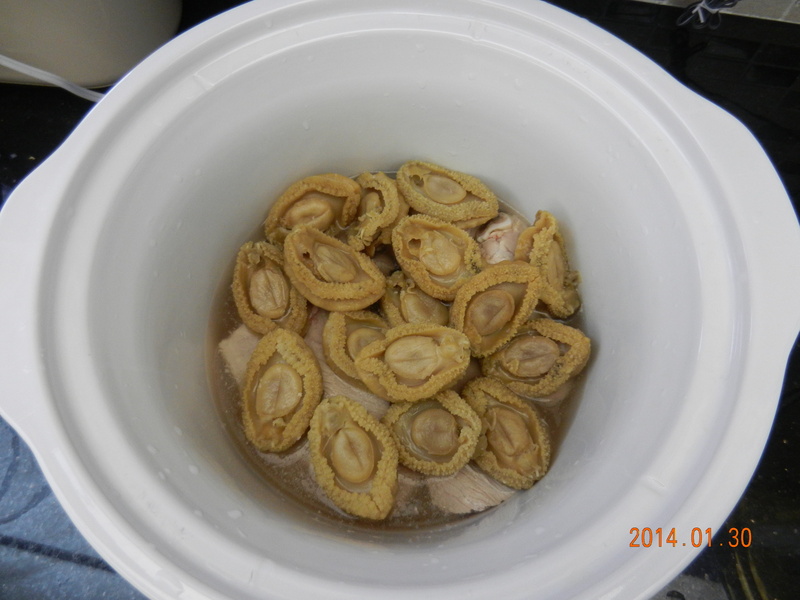 Place the dried abalone in a large bowl with more than enough cool water to submerse them. Leave them, covered, overnight in the refrigerator. Discard the water. Then vigorously scrub off any whitish or greyish residue from the surface of the abalone under cool running water. If necessary, you could use a small knife to scrape the residue off of the abalone. Tear off any breathing ducts that you may find and discard them. Then place the abalone in a clean bowl with just enough fresh cool water to keep them submersed. But keep in mind that the abalone will double in size and will need to remain completely submersed in water. So you don’t want to have too much water and you don’t want to have too little of it, either. Leave the abalone in this water, covered, in the refrigerator for three days. (Note: If you’re using large sized abalone, soak it in this water for 7 days, without changing the water.) It is very important to cover the container so that the abalone don’t soak up any unpleasant odors from the fridge. It is also important that you keep the water that the abalone is soaking in. You will need that to make the sauce. Most importantly, do NOT add any salt or seasonings until after the abalone have finished cooking; otherwise, the abalone will shrink in size. Place the pork ribs in a pot of water and bring to boil over high heat. Once the water reaches a rolling boil, reduce the heat and allow it to gently boil for 10 minutes. This will bring foam and residue to the surface of the water. Dump the water down the drain and rinse off the pork ribs under cool running water. Then arrange the pork ribs so that they cover the bottom of the slower cooker crock pot. Then place the abalone in a single layer on top of the pork ribs. Gently pour the water that the abalone was soaking in into the crock pot. Lastly, place the skin-on chicken pieces in a single layer on top of the abalone. Once the abalone is cooked to your liking, discard the chicken and pork, and place the abalone to a plate. Transfer the liquid from the crock pot to a heavy bottomed sauce pot and bring it to a boil, covered, over medium to medium-high heat. While the sauce is coming to a boil, you may slice the abalone thinly if desired; we prefer to serve it whole. Add oyster sauce to the pot to taste (I recommend starting with 2 teaspoons). When the flavour of the sauce is to your liking, add the abalone (whole or sliced) and stir until it is heated through. Dish it out and serve immediately. Gung Hai Fat Choy; Sun Neen Fy-Lok! Thanks so much for the tip! Happy New Year to you too! Looks delicious! 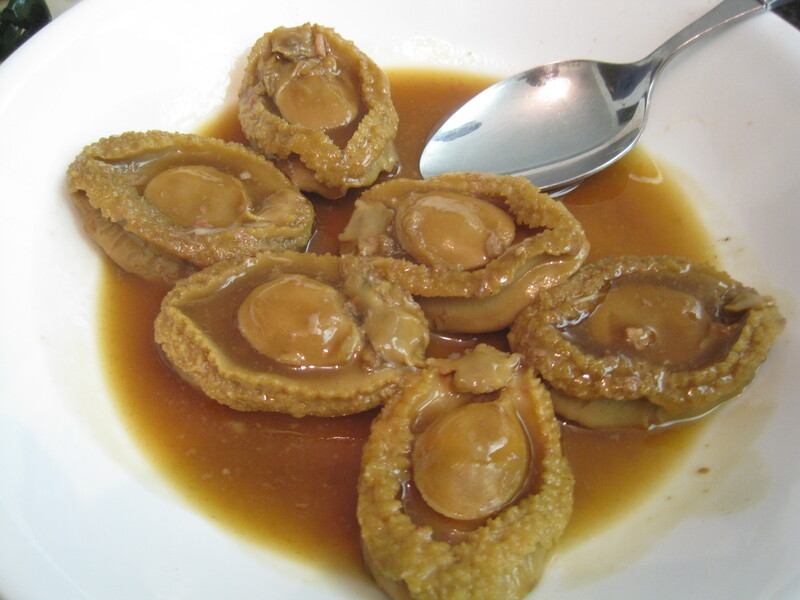 Any tips on how to make this using frozen abalones? I have 10 small ones in their shells and I’m looking for a way to make them yummy! Thanks!